I went to San Angelo this weekend and visited my parents and Megan, KC and baby Katrina came for a visit from Austin also. We had so much fun. 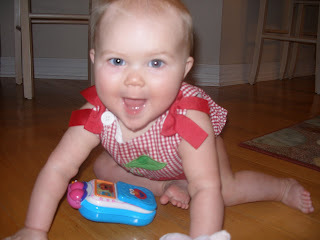 She is now crawling and is saying Mama. My sister Laurie, her friend Tammy, Megan, Katrina and I went shopping Saturday on Concho Street. Great old street with great shops. I bought some cool stuff at a bead store and a cowboy shirt! so cute. We had good food, good shopping and now, especially with the time change I need to rest! This scary scary guy is Kyler, my nephew. He was very scary! This is Kyler without the scary mask. He's such a sweet and cute kid. This is the 1st year his big brother, Kanton, 12 and in the 6th grade has not gone trick or treating with the family! Very different for them! This is miss katrina in her pink bunny costume for her 1st halloween. she looked adorable! Kyler thinks she is pretty cute! Another shot of katrina. she is growing soooo fast! Another one of her with her little baby! When Megan puts her to sleep (out of town) Katrina plays with her face, her nose and everything she can see until she goes to sleep. It was so sweet. Saturday night we watched the Texas Tech and UT game. OMG! Was that a great game or what!!!!!! My husband graduated from Texas Tech and my daughter graduated from UT. I was for Texas Tech simply because they have not won near as many major games as UT. It was a nail biter! KC, Megan's husband and Katrina were all decked out in their UT clothes! 3 Responses to "fun time in san angelo"
Katrina is a little doll...love her UT outfit. Her costume is precious too. Hmmmmm wonder what is going on in the wine country....surely you have something to blog about sistah!!!!! !